I am a huge fan of soda bread. Personally, I tend to prefer the traditional Irish type; Americans seem to have this notion that soda bread should be sugary and contain raisins, caraway seeds, spices, or orange zest. This is well and good if you have a sweet tooth and have an extreme longing for cake, but my salty palate and I prefer the unadorned, more bready sort. Today’s bread is a compromise between the two varieties: the dough itself is under-sweet, biscuity, and has a fair amount of whole wheat flour, but is also spotted generously with dried currants. Were I just making these muffins for my own immediate gratification, I would have left the currants out, but there’s no way I could eat all twelve in one sitting; currants were really a necessity. See, the one problem with Irish-style soda bread is its tendency to dry out quickly, within a day or even a few hours. If even a whole great loaf of soda bread can’t stand up against the ravages of staleness, what chance would a poor little muffin have? None, is what. You see now why I had no choice but to include currants, with their moisture-giving and -retaining abilities. But despite the obligatory nature of the addition, and my usual steadfast aversion to sweet things in my soda bread, I found the currants were in fact quite welcome in the bread. The jammy flavor eliminated any real need for preserves or jelly on top, though a pat of butter was not out of order, especially when eaten at breakfast. 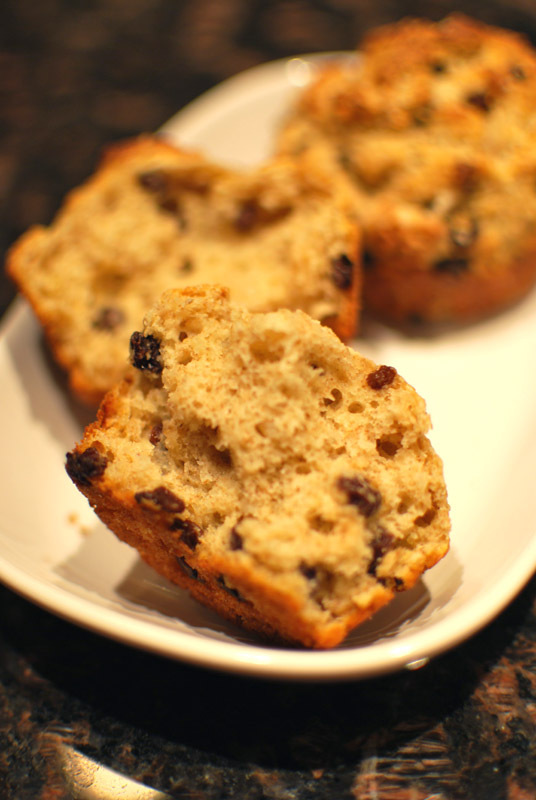 Sans currants, these muffins would be right at home on the dinner table, especially served with a warm soup to dunk them into (and removing any unpalatability that might result from staleness). The flavor of the dough itself is mild enough that it won’t overwhelm anything you might pair it with, but the texture, though light, is hearty enough to hold its own with even a thick and robust stew. These individual soda breads are fast, crunchy, tender, grainy, and delightfully rustic. Their craggy tops, with their freckles of currants, will certainly brighten any chilly weather that might come your way. 1. Preheat the oven to 400º F. Grease 12 muffin tins thoroughly, and dust with flour, knocking on the pan to remove any excess. 2. In a large bowl, whisk together the flours, sugar, baking powder, and baking soda. Add the butter, and quickly cut into the flour, either with a pastry blender or by quickly pinching and tossing with fingertips. Stir in the currants. 3. Whisk the buttermilk and egg together, and add to the dry ingredients. Using a spatula, gently and quickly stir until just blended together. Divide the batter evenly among the muffin tins. 4. Bake at 400º F for 20 to 25 minutes, or until golden brown. 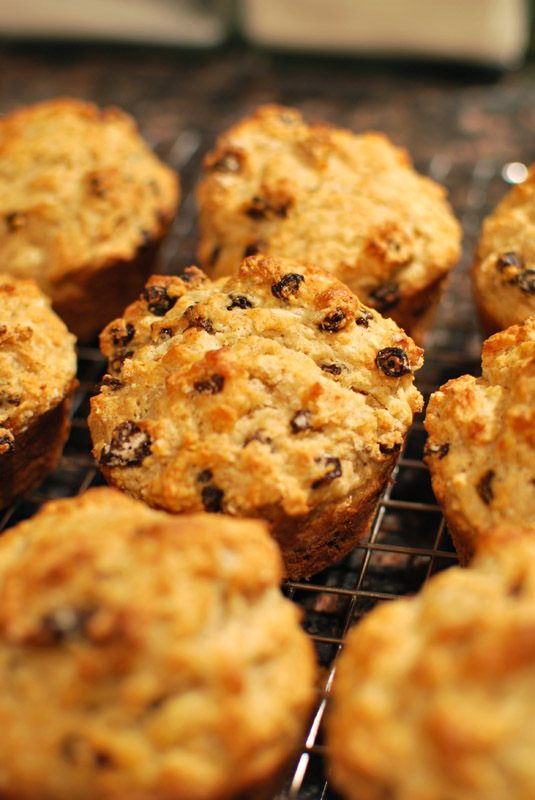 Remove muffins from the pan, transfer to a wire rack, and cool slightly before serving. 1. Soda bread muffins can be made 8 hours ahead. Cool completely on a wire rack, and store in an airtight container at room temperature. If not eating within a day or so, wrap muffins well and freeze. Reheat in a 350º F oven for 5 to 7 minutes, or until heated through. This entry was posted in Quick Breads, Savory, Sweet. Bookmark the permalink.